When the soil in flowerbeds is hard-packed, it’s dry and lacks the structure and nutrients necessary for growth. Flowers need a loose, friable soil for healthy root systems and bloom. Hard-packed soil is easily corrected with the addition of humus and moisture. Humus is simply organic matter like well-rotted manure and compost. If the soil is very compact, dig generous shovelfuls of both into the soil. 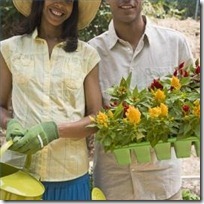 If the bed is filled with plants, cultivate with a garden fork to avoid damaging roots systems. The addition of sand will also help to change the structure of the soil, especially clay. Add a shovelful of sand to every 20 square inches and cultivate it into the soil along with the organic matter. Add a thick layer of mulch to the top of the flowerbed. Mulch is organic matter that primarily keeps moisture in the soil and weeds at bay, but it also adds necessary nutrients to the soil. Water the garden well after replanting. Flowers need water in all weather. Water helps the flowers to take up the nutrients in the soil, resulting in a much healthier flower garden.